. :: Syrian Omar Hamsho on horse Lordano claims the Longines Grand Prix at the 2018 Gulf Elite Tour CSI2* ::. It was a night of high stakes and celebration on Saturday January 27th, 2018 as Omar Hamsho took home the Grand Prix title. With only 4 riders making it through to the jump-off, and with only tenths of seconds dividing them, it all led to a thrilling finale to the weekend held in the spectacular indoor arena of Sharjah Equestrian and Racing Club. Hamsho cleared the Grand Prix course designed by Marc Debaere, in an impressive 34.90 seconds beating Egypts, Abdel Said who also flew round clocking a time of 34.92. Third position was taken by Gulf Elite Tour Ambassador, and the UAE’s Sheikha Latifa bint Ahmed al Maktoum on Peanuts de Beafour. Great Britain’s, Georgia Tame, Saudi rider, and Olympic Medalist, Ramzy Hamad Al Duhami and Belgian athlete, Pieter Clemens came 4th, 5th and 6th respectively. The world class three-day event, from January 25th-27th, was run under the supervision and stewardship of the Emirates Equestrian Federation and FEI. The event saw over 185 horses line up and competitors from 32 countries compete in a series of 10 classes. Show sponsors included Longines, Mill Capital, Jumeirah Hotels, JLL Qantara Consultants and Generosity Water. The Jumeirah Mini GP title went to Belgian Rider Pieter Clemens on horse Selberus. Clemens flawlessly completed the jump-off round in 42.27 seconds. He was among 36 competitors who took part in the challenging course with fences up to140cm. Second place was taken by Italian, Natal Shweidan, Clona do Boa with third place going to the UAE and to Mohammed Al Hajri on Catan 13 who although was the fastest round the track in 38.20 seconds, but carried with him an eight point penalty. Abdul Rahman Amin continued his impressive season at the Gulf Elite’s CSI 2* following a winning weekend at the Dubai International Championship. Amin took first place honors in the Sharjah Welcome Stakes, beating 76 competitive entries. Second place went to Mohammed Sultan Al Yahyai on Burdocks and third place went to Syrian rider, Hisham Gharib, on Elton. The split-second difference between the winning rounds set a very competitive tone to the weekend in this opening class. 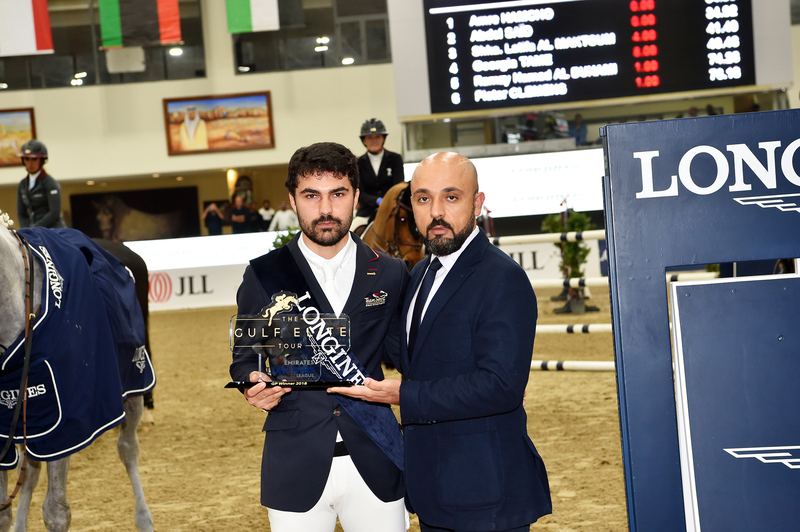 Abdul Amin went on to become the first ever UAE rider to score a hat-trick in an CSI2* International, claiming both the Generosity 2 Phase and JLL Joker Accumulator in addition to the Sharjah Welcome Stakes. Salem Khamis Al Suwaidi on Feline S was victorious in the Qantara Medium Tour over the technical and challenging 130cm course. Al Suwaidi completed his round in 61.25 seconds. Mohammed Al Hajri on Catan 13 came in second with a time of in 61.89, leaving third place to Danish rider, Tina Lund on Pace Hautier. Great Britain’s Nigel Coupe, winner of the Hickstead Derby and Leading Showjumper of the Year in 2017, was the first to qualify to Saturdays Longines Grand Prix. A highly competitive field went head to head in the GP Qualifier on a course of fences set at 140cm, with 14 scoring clear rounds and qualifying. Coupe went around in 58.32 seconds, leaving second position to Egyptian rider Abdulkader Saeed on horse Etchy Lambrock who finished in 61.15. Third place went to Mohamed Ahmed Al Owais and Tina Lund in 62.39 seconds. Dutch horseman Henk Faoule de Paul came first in the second qualification session securing his place Grand Prix. Henk on Luwman Z beat 25 coming first by a narrow margin to Saudi rider Ramzy Al Duhami and Venutia de Conceir. Third place went to Russian rider Vladimir Tuganov completing in 29.82 seconds. Friday night competition got heated and exciting starting with the Longines Speed Challenge. Podium position was set with a ‘throne’ for the fastest rider to take until their time was beaten and the rider was replaced. Jordanian rider Ahmed Mansour held the seat after taking the lead although a strong challenge was made by Danish rider, Tina Lund and Pace Hautier who made a strong challenge to move Mansour from the top spot. Unfortunately, she was unable to beat the Jordanians 62.2 seconds. Among the top competitors for the prize was Dutch rider Henk Faoule de Paul and Delithia Fi LS finishing with the fastest time of 59.40 seconds but took a 4 second penalty. The Mill Capital Masters wows the crowd and beats records as Al Sharbatly and Sabino give a show of true sportsmanship and share the title. The Tour’s second day ended with an epic display of show jumping skill in the Mill Capital Masters. The competition requires the course be set at a minimum of 145 cm, after each of the 12 competitors complete round one, all who are clear move forward into round two where each rider in turn can choose a fence to raise. This continues through rounds two and three, where the twelve who began became two going into the fourth and final round. With fences now set at 170cm the two leaders decided that to take on the course at speed would be both dangerous and damaging to their horses and the competition. Spectators of all ages held their breath as Sharbatly and Sabino cleared the 1.70 fences demonstrating both nerves of steel and incredible equestrian skill captivating the audience in this epic face-off that thrilled everyone. A particular high point of the whole weekend was the ‘On Foot Puissance’ in aid of The Gulf Elite Tour’s chosen charity, Just World International. Sheikha Latifa Bint Ahmed al Maktoum and Abdullah Al Merri are both Global Ambassadors for Just World and it was a fantastic opportunity to raise awareness and money for the charity that provides access to education, nutrition, health and hygiene to more than 6500 children around the world. Over 30 riders took part, leaping on foot over the ever-increasing fence until one man was left standing. The winner was awarded a prize donated by Jumeirah Al Qasr Hotel. Some riders matched the Gulf Elites donation from their own prize money winnings, an incredible show of humility and generosity. The fifth round of the Gulf Elite Tour is scheduled for 15th-16th March, with the participation of many of the leading names in the world of show jumping.